Download "Math 151. Rumbos Spring 2014 1. Solutions to Assignment #22"
1 Math 151. Rumbos Spring Solutions to Assignment #22 1. An experiment consists of rolling a die 81 times and computing the average of the numbers on the top face of the die. Estimate the probability that the sample mean will be less than 3. Solution: Let X k, for k = 1, 2, 3,..., denote the outcome of the k th roll of the die. We want to estimate PrX n 3, where X n is the sample mean with n = 81. In this case we have µ = EX k = 3.5 for all k and σ 2 = VarX k = 35/12 for all k. Since the outcomes of the rolls are independent and n = 81, we can use the Central Limit Theorem to approximate Xn µ PrX n 3 = Pr σ/ n / 12/ 81 PrZ 2.63, where Z Normal0, 1, by the Central Limit Theorem. Thus, using the symmetry of the pdf of Z Normal0, 1, PrX n 3 1 F Z 2.63 = , so that PrX n , or about 0.43%. 2. A random sample of size 49 is taken form a distribution with mean µ and variance σ 2. 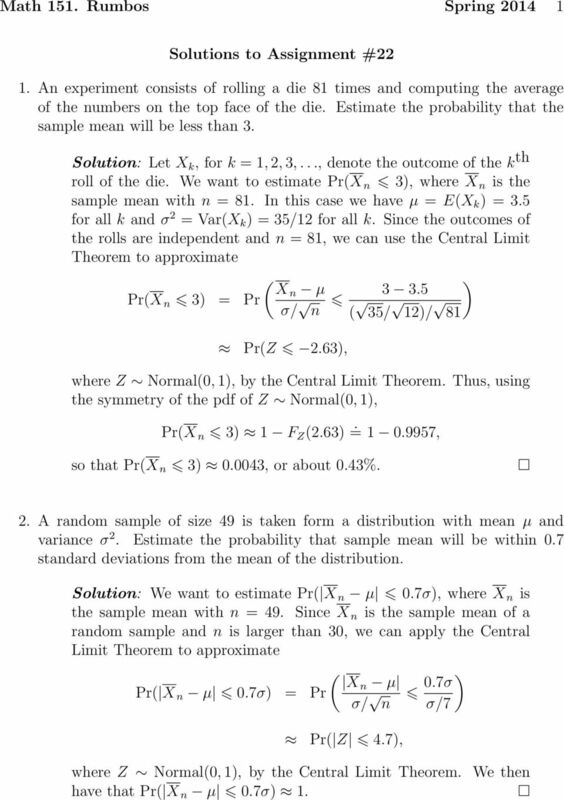 Estimate the probability that sample mean will be within 0.7 standard deviations from the mean of the distribution. Solution: We want to estimate Pr X n µ 0.7σ, where X n is the sample mean with n = 49. Since X n is the sample mean of a random sample and n is larger than 30, we can apply the Central Limit Theorem to approximate Xn µ Pr X n µ 0.7σ = Pr σ/ n 0.7σ σ/7 Pr Z 4.7, where Z Normal0, 1, by the Central Limit Theorem. We then have that Pr X n µ 0.7σ 1. 2 Math 151. Rumbos Spring A large freight elevator can transport a maximum of 9800 pounds. Suppose a load of cargo containing 49 boxes must be transported via the elevator. Experience has shown that the weight of boxes of this type of cargo follows a distribution with mean µ = 205 pounds and standard deviation σ = 15 pounds. Based on this information, what is the probability that all 49 boxes can be safely loaded onto the freight elevator and transported? Solution: Let X k, for k = 1, 2, 3,..., 49, denote the weight of each of the boxes. We want to estimate Pr X k 9800, where µ = EX k = 205 pounds, σ = VarX k = 15 pounds, and n = 49. We can therefore apply the Central Limit Theorem to estimate n Pr X k 9800 = Pr X k nµ , 045 nσ 715 PrZ 2.33, where Z Normal0, 1, by the Central Limit Theorem. 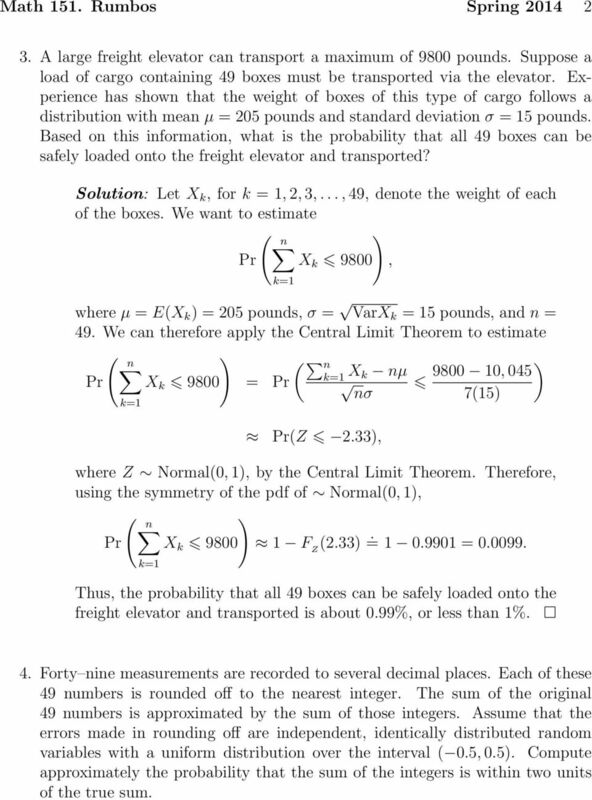 Therefore, using the symmetry of the pdf of Normal0, 1, Pr X k F Z 2.33 = = Thus, the probability that all 49 boxes can be safely loaded onto the freight elevator and transported is about 0.99%, or less than 1%. 4. Forty nine measurements are recorded to several decimal places. Each of these 49 numbers is rounded off to the nearest integer. The sum of the original 49 numbers is approximated by the sum of those integers. Assume that the errors made in rounding off are independent, identically distributed random variables with a uniform distribution over the interval 0.5, 0.5. Compute approximately the probability that the sum of the integers is within two units of the true sum. 4 Math 151. 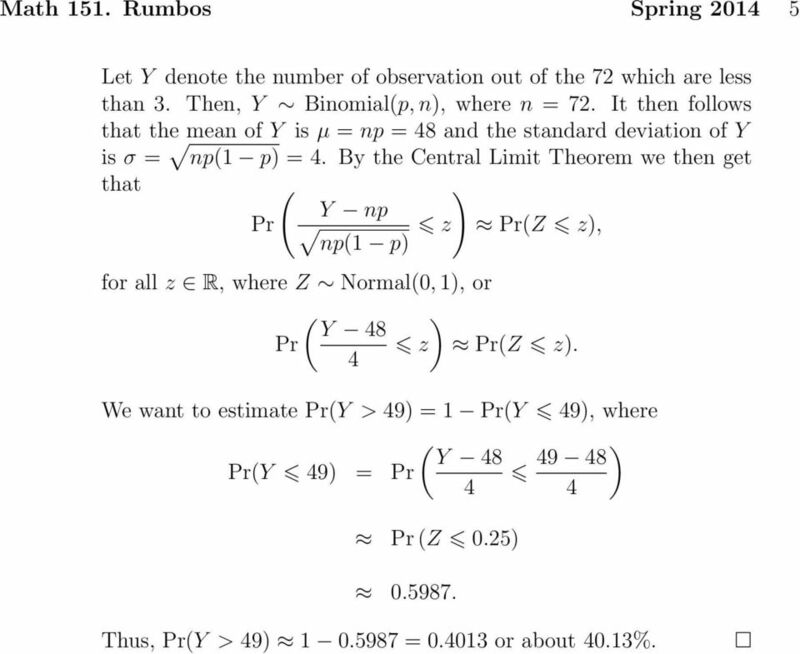 Rumbos Spring It then follows that Pr W 2 = Pr U n 2/n U n = Pr σ/ n 2 σ n Pr Z 2 σ n 2 = 2F Z σ 1 n = 2F Z F Z , or about 67.78%. Thus, the probability that the sum of the 49 integers is within 2 units of the true sum is about 67.78%. 5. Let X denote a random variable with pdf 1 if 1 < x <, f X x = x 2 0 otherwise. Consider a random sample of size 72 from this distribution. Compute approximately the probability that 50 or more observations of the random sample are less than 3. Solution: The probability that a random observation from the distribution is less than 3 is given by p = 3 f X x dx = x 2 dx = 2 3. 5 Math 151. Rumbos Spring Let Y denote the number of observation out of the 72 which are less than 3. Then, Y Binomialp, n, where n = 72. It then follows that the mean of Y is µ = np = 48 and the standard deviation of Y is σ = np1 p = 4. By the Central Limit Theorem we then get that Y np Pr z PrZ z, np1 p for all z R, where Z Normal0, 1, or Y 48 Pr z PrZ z. 4 We want to estimate PrY > 49 = 1 PrY 49, where Y PrY 49 = Pr 4 4 Pr Z Thus, PrY > = or about 40.13%. Practice Problems for Homework #6. Normal distribution and Central Limit Theorem. Recall: Ch5: Discrete Probability Distributions Section 5-1: Probability Distribution A variable is a characteristic or attribute that can assume different values. o Various letters of the alphabet (e.g. 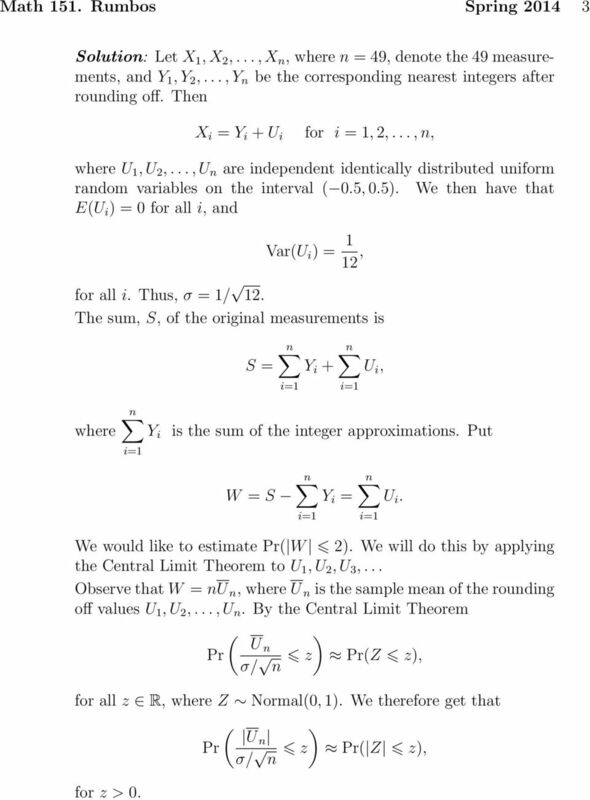 University of California, Los Angeles Department of Statistics Statistics Instructor: Nicolas Christou Random variables Discrete random variables. Continuous random variables. 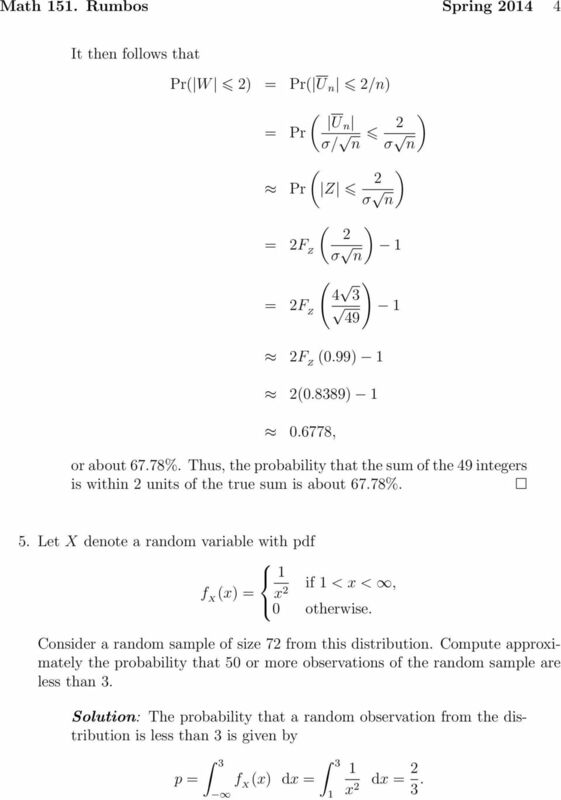 Discrete random variables.